While Frank Sinatra was singing about New York and Chicago, Dean Martin was taking inspiration from a different and unlikely city: Houston. According to the lyrics of Martin's 1965 hit, he'd been spending time in some other town, where he'd found unfriendly people, bad luck, and a serious case of the blues. He croons that he's going back to Houston to, in short, return to good fortune and good people. Was Dean just looking for a new signature city? Or perhaps there was some prescience there. In the last decade, Houston's population grew by 24%, which is five times the rate of New York, San Francisco and Boston. And the trend continues, as scores of people are still taking a cue from Dean and going back to Houston. Who can blame them? Houston is today's preeminent American city for opportunity. Since the 2008-2009 crash, most American cities have seen stagnating growth at best and nagging unemployment, while Houston has been booming. The U.S. Chamber of Commerce recently ranked Texas as the sixth most enterprising state in the country for its business friendly climate and epicenters of vibrant and growing industries, with Houston being a top draw. This makes sense considering that Houstonians saw more wage growth in 2011 than any other city. And with real estate prices on the rise, Houston's housing market has fared better than almost all American cities. Dean Martin was right: Houston just may be the best place to find good fortune. Please read on in our special section below for more great things happening in Houston. Since the fall of Lehman, economies all over the world have been putting out economic forest fires every few months. A crisis is narrowly avoided, but then another one threatens. Recent measures taken by the Federal Reserve and the ECB have postponed a day of reckoning yet one more time. We will kick the can until we no longer can. The power of self-preservation will keep our political and financial leaders consumed with trying to keep this game going. Should all current circumstances remain the same, eventually we are going to reach an economic dead end. Current conditions in Japan, Europe and the United States present no obvious avenue through which these economies can pay back all the money they've borrowed. From our view, there just isn't enough true organic growth to provide the tax receipts to pay all those debts, much less afford all those looming social safety net commitments. It's impossible to know, perhaps even imagine, what economic game changers could be in the pipeline. Few could have seen the transformative technologies of radio or automobile coming, or quantified the prosperity they would create. The optimist wants to believe that such game changers might very well be on deck, soon to hit a home run of real organic growth and expand prosperity beyond even what we saw last century. But the realist can only observe the facts available at a given moment. The foundation to economic activity has always been and will always be natural resources. From natural resources, people can imagine and produce goods. If there is enough natural resource and production activity, a service economy can then develop and grow. From our view now, there seems some economic hope in natural resource activity, with one category of resources standing out the most. Nothing in the world - nothing - works without energy. No matter how long our leaders continue to kick the can, and no matter what happens on a macroeconomic level, the fact that nothing works without energy remains a constant. Since this is true, there's a strong case to be made that the future economic epicenter of not just the United States, but also perhaps even the world, is Houston. 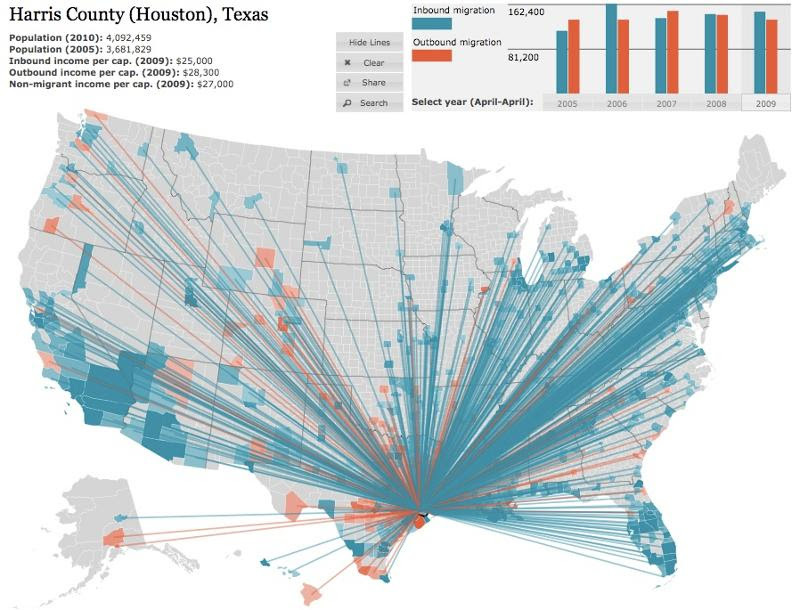 Tremendous economic development opportunity seems to exist within Houston's reach. Let's hope our leadership can grasp it. Not fully immune to the numerous stress points in today's hiring market, Houston has fared better than pretty much every other major city in the country. Among major metropolitan areas, Washington D.C. might have the only employment market more robust than Houston, but then that tells us just about everything we need to know about our country's economic situation. Technology is always a catalyst for economic growth, which is proving to be the case once again in Houston. Our technology isn't social networking or Internet gaming, it's all about the foundation to all economy - natural resources. Unconventional shale oil & gas production isn't new; it's more like a 30-year overnight success story, and Houston is now benefiting from it greatly. As capital goes, so goes employment because it's capital that creates jobs. So as more and more capital is funneled into unconventional oil & gas regions, more and more jobs are created throughout Houston's economy. One might even suggest unconventional oil & gas is the only positive organic economic catalyst in the national economy right now. Additionally, Houston's hiring market in manufacturing, processing, transportation, health care and numerous other basic industries like death care, automobile retail, waste management and industrial construction also appear to have a fine future. Near term economic calamity in Europe could certainly disrupt demand for energy, which would cause capital and jobs to contract. But since nothing in the world works without energy, and since Houstonians have no problem getting dirt under their fingernails, Houston seems to be in the job growth catbird seat for quite some time to come. It's always easiest to eat crow while it's still warm. I won't be taking home much, if any, financial inheritance from my parents, but solid values are probably a far better legacy anyhow. Thanks, Dad, for this and many other little pearls of wisdom. None of us is perfect. We're all going to make mistakes at different times in our life. No path is all smooth sailing. If all were, we would be spoiled, entitled and incapable of handling those unexpected challenges that will eventually occur. When we inevitably make mistakes, the absolute best policy is to fess up and take responsibility immediately. Mistakes fester and fester and fester. They are no different from a communicable disease. The longer you avoid them, the more problematic they become. Live a clean life, and always take the high road. Your children and everyone around you will be all the better for it. And since we can't take all our toys with us when we go, it is our legacy of contribution and spirit that ultimately is our real wealth. Until 2020, jobs related to health care, personal care, social assistance, and construction are projected to see the fastest growth, expanding in total by 14.3% or 20.5 million jobs by the end of the decade. By the end of 2011, unemployment had decreased slightly in 37 states and D.C., held steady in 10 states, and increased in 3 states. The largest month-over-month increase in jobs was in Texas. Union membership in 2011 was 11.8%, more or less unchanged from 2010. The first year union membership data are available is 1983, when the membership rate was 20.1%. 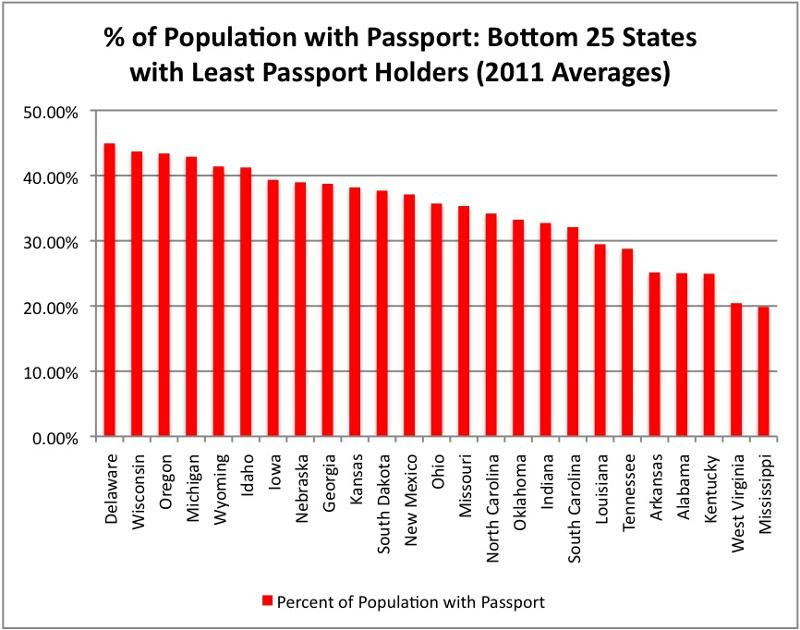 Reading about all the migration into Houston and Texas, particularly by that of college educated workers, got us wondering about how many Texans hold passports. 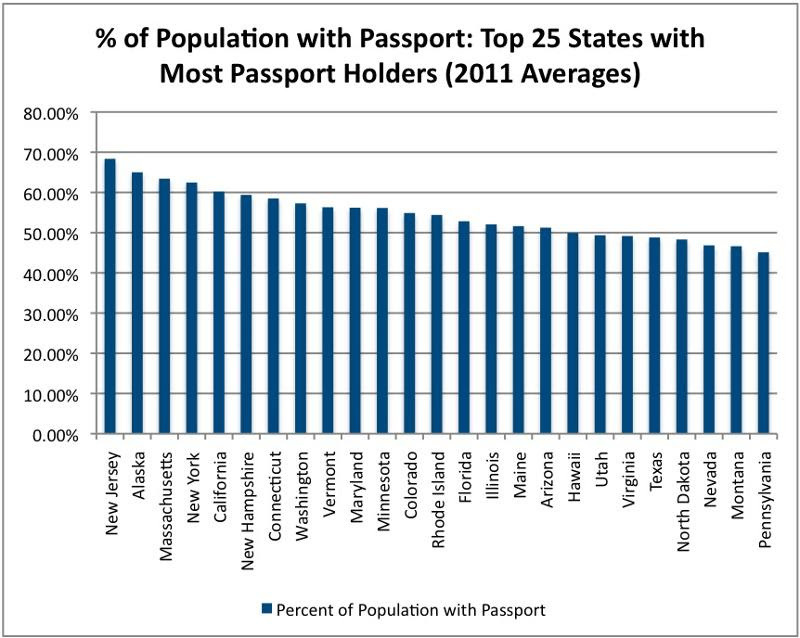 And how people hold passports in all the states, for that matter. We found the data surprising in some cases, not surprising in others, but altogether interesting. In 2010, Forbes' Joel Kotkin declared Houston a model city. He cites its business friendly environment, a flood of immigrants from both the U.S. and abroad, an increase in college educated residents, low taxes, and affordable, yet stable real estate. All indicators since this article ran only confirm Kotkin's assessment of Houston. For its annual Global MetroMonitor report, the Brookings Institute compiled 2011 GDP, employment, income and population data from the world's largest 200 metropolitan economies and found that 90% of the fastest growing on the list were outside of the U.S. But Houston stood apart. With almost all North American economies falling in the rankings from the year before, Houston was well on the rise. Only two American cities made the list of the top 40 fastest growing global metropolitan economies, with Houston ranked at 19, and Dallas at 36. Please follow this link to the Brookings Institute's interactive MetroMonitor map. Selecting Houston reveals data showing strong employment and wage growth for the city, as well as an economy well diversified in multiple industries. Please click here to download a PDF of the full Global MetroMonitor report. PayScale puts Houston at the top of the list for strongest wage growth in 2011. After some recessionary bruising, Houston's wages grew 2.2% from 2010 to 2011, outpacing national averages, and have returned to their peak 2008 levels. Certainly a contributing factor to Houston's healthy wages is that Mining, Oil & Gas Exploration tops the list of industries that lead earnings growth last year, with a 2.6% increase from 2010. In yet more auspicious news for Houston, Q4 home prices in the Bayou City saw a 1.8% uptick, while the national average was a 0.4% loss. Houston home prices are expected to grow 3% in 2012, far better than the 0.2% value increase predicted for the average American home this year. The U.S. Chamber of Commerce compiled and compared overall state and local tax burdens, corporate taxes, small business costs, state government budget gaps, and cost of living indices to rank the most enterprising states in the Union. Texas came in sixth, thanks to its low tax rate, low cost of living and a business-conducive environment amounting to migration and job growth. The full PDF report notes that Texas has invested heavily in infrastructure like ports, airports and roads, which is key to attracting new business. Interestingly, recent Census data has also debunked the notion that the most educated migrants continue to flock to "hip and cool" coastal cities. In fact, educated workers are moving less to New York and San Francisco and more to Houston, Dallas, Austin, Nashville and Kansas City. Should such migration persist, these integral workers will continue to feed the core of growing industries, and thus the economies, in these cities. Houstonians are ever more passionate about the city's beautification and greening and are voting for more useful public green space. Red Fields to Green Fields is an organization that buys financially distressed properties (properties "in the red") and converts them into green spaces. The city has partnered with the foundation to take distressed, underutilized or foreclosed properties and turn them into conservation land, parks, infrastructure improvements or other green space. The plans aim to continue to attract new and more economic development, as well as improve surrounding property values and quality of life. Much of the targeted space in Houston sits near its bayous. The objective is to create an interconnected system of parks, which could create up to 55,000 jobs in 10 years. Please follow this link to download a PDF with more detail about Houston's collaboration with Red Fields to Green Fields. Click on the image to watch a video about Houston's partnership with Red Fields to Green Fields. Exactly 100 years ago, America had just come out of a two-year recession. What followed was a century of unprecedented economic growth, in which Americans became 700% wealthier, thanks to the American-born, world-changing technologies that ushered in the last century. Might we again be on the precipice of another transformational technological period with the potential to create even more prosperity? Many see for this century big data, smart manufacturing, and a wireless revolution as the telephony, automotive, stainless steel and radio technologies of the past century. And the U.S. owns each boon. Given the inertia of our enterprising, risk-taking, and imaginative history, America may just be poised to see another Roaring Twenties. In 20 years, global energy consumption will increase by 40%. Historically, one source of energy has dominated energy consumption. But by 2030, BP is predicting that we'll see this change for the first time since the pre-industrial age, with oil, coal and gas usage all converging. Follow the link for more insight. Top executives often believe their most important job is to develop a stellar strategy. But any strategy is only as good as the people implementing it. An equally important priority for executives is keeping their team engaged, and research has shown that the best way to do this is by making work meaningful for employees. Analysis of anecdotal data from dozens of employees across seven American companies revealed to McKinsey four traps that leaders fall into that cause them to undermine their team's productivity and success by eroding the meaning behind their work. This insightful article outlines how leaders can avoid these common pitfalls that cause them inadvertently to sabotage their own strategies and goals, and also offers ideas to infuse a company's mission with meaning. Your business attitude is a choice. I choose optimism. A University of Pennsylvania psychology study determined that optimistic people are more successful than equally talented pessimists. Intrigued by this research, Metropolitan Life decided to test for a prospective sales employee's level of optimism. Ultimately Metropolitan Life found that optimists outsold pessimists by 20% in the first year and 50% in the second year. Such dramatic improvements make a strong case for optimism, which can be fostered from the top down. Optimism doesn't mean abandoning reality, but optimistic leaders will recognize their power and ability to improve challenging situations and inspire others to follow suit. Although some might find being actively and openly appreciative towards employees a little touchy feely, research shows it's well worth it. One study revealed that whether or not an employee believes his manager genuinely cares about his well being is directly correlated to how engaged he will be on the job. Another study showed that for high performing teams, positive feedback outweighs negative feedback 5.6 to 1. Conversely, the ratio for low performing teams is 0.36 to 1. The upside of genuine appreciation is clear. Follow the link for ideas on how to use appreciation to inspire happier and more productive employees. Warren Buffett has often been quoted saying that when he hires, he's looking for people who have intelligence, energy, and integrity. Only those who show strength in all three of these areas cut it for Buffett. This article suggests several tactics to discern how a candidate ranks across all three categories, from types of interview questions to ask, to puzzles and challenges to propose to an interviewee.